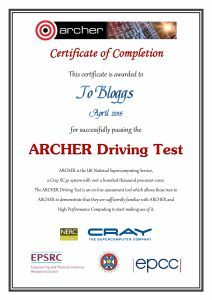 The ARCHER Driving Test is an online assessment tool which allows those new to ARCHER to demonstrate that they are sufficiently familiar with ARCHER and HPC to start making use of it. It is suitable for anyone who has completed a Hands-On Introduction to HPC ARCHER training course (or followed the material online, or for users of other HPC systems who have familiarised themselves with the specifics of running jobs on ARCHER by reading up the appropriate preparation material resources. On successful completion of the Driving Test, you will be invited to apply for an account on ARCHER and awarded an allowance of 1200 kAUs to use to run jobs over a period of up to 12 months. This scheme is intended to promote access to HPC to new users and communities who would not otherwise be able to gain initial experience on HPC systems. In particular we hope to give a head start to potential future ARCHER users. Applicants would normally be resident in the UK, perhaps with an existing connection to a research institution such as those listed at http://www.epsrc.ac.uk/funding/howtoapply/fundingguide/eligibility/organisations/. However, if you feel you fall outwith this group, please do get in touch with training@epcc.ed.ac.uk to discuss whether we can help. Only one Driving Test account application per person is permitted as it is intended for new users to gain first-time, hands-on experience. The Driving Test is intended for academics and non-academic researchers working in UK based research institutions within sectors related to the remits of the ARCHER partner research councils for pre-competitive computational research runs. The final decision on awarding access to ARCHER remains with the service. We would strongly recommend that you read over the appropriate preparation material before attempting the test. Click here to start the Driving Test. Please ensure you enter your email address when prompted as without this, we will be unable to award your ARCHER time or send your Completion Certificate. Generic introductory material on High Performance and Parallel Computing for those new to HPC. ARCHER is sometimes used as an example to illustrate general concepts, but the course is applicable to almost all modern HPC systems. ARCHER-specific material covering the details of the hardware and software environment on ARCHER. What material should I study? If you have no prior experience of High Performance or Parallel Computing, you should study all the material: the generic and the specific. The generic material does not assume any programming ability: it assumes general familiarity with computing such as logging on to remote systems and using an editor. For all the practical exercises we supply working programs that you can compile and run. By default they are set up to run on ARCHER, so if you have an account on ARCHER you should be able to undertake the exercises. You should also be able to run the exercises on a local cluster with some small changes to the scripts; if you want advice on this, please contact the ARCHER helpdesk. If you have prior experience of HPC, e.g. you already use a local cluster or have previously attended the Hands-On Introduction to HPC course, then you should be able to go straight to the ARCHER-specific material. This material does not include any hands-on exercises. However, successfully running the exercises from the generic Introduction to HPC course is a useful test that you have understood all the key points on how to use ARCHER. Click here to start the KNL Driving Test.